Coll. No. 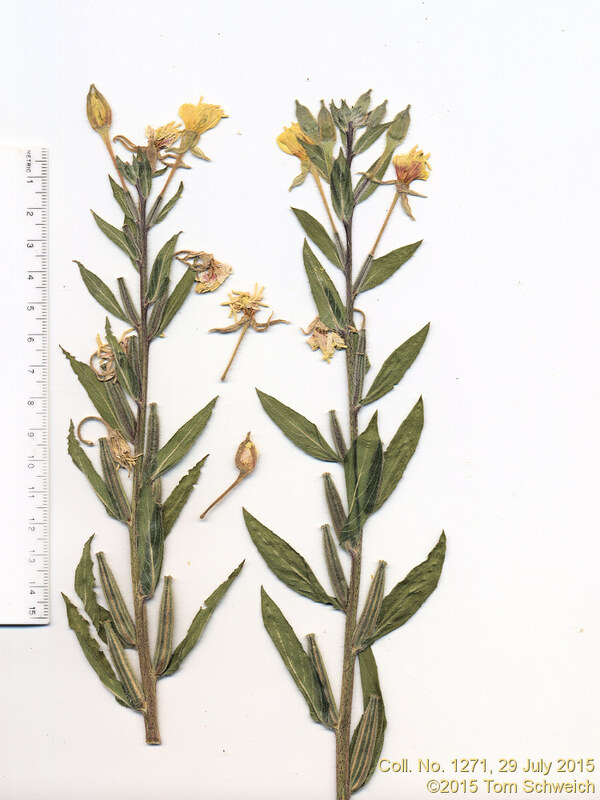 1271, 29 July 2015, characters observed: Perennial herb, to 25 cm., ±straight hairy throughout; Stem, eglandular, villous, hairs with red pustular bases; Leaves, cauline, alternate, sessile, 55 mm. × 12 mm. wide, elliptical, reduced above, entire, very shallowly toothed; Inflorescence, leafy bracteate spike; Sepals, #4, 13 mm., reflexed; Floral tube, 24 mm. ; Petals, #4, 9 mm. × 5 mm. wide, yellow fading pink, obovate, entire; Stigma, lobes #4; Capsules, 25-33 mm. ; Seeds, 0.8 mm., squarish, glabrous throughout. Field Notes: Coll. No. 1271, 29 Jul 2015. Other photos about Species or Onagraceae Oenothera villosa.